Goleta is a unique place. 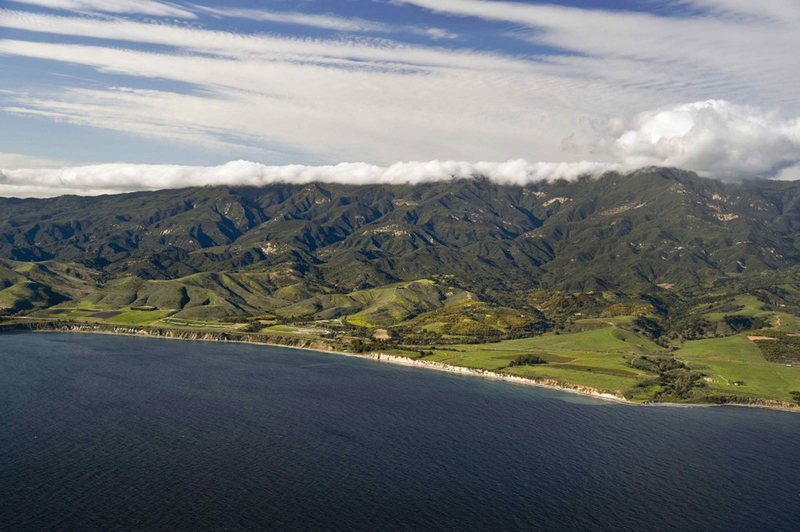 We are surrounded by the beautiful Santa Ynez Mountains on one side and the blue Pacific Ocean on the other. 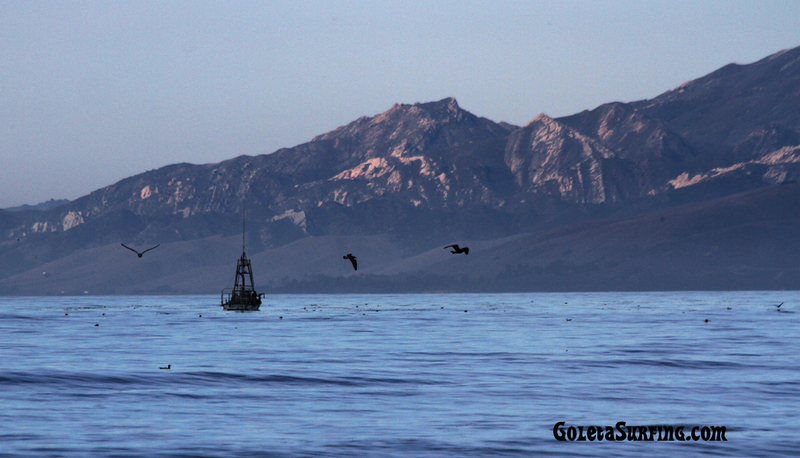 The steep mountains run into the sea at Gaviota and Rincon, isolating us from the outside world. This was a predicament for the first European settlers. The only way in or out for people and supplies was by steamboat. Today, if you want to travel north from here, your route options are still pretty limited. You can get on a boat, take to the air, or make your way through one of the mountain passes; San Marcos, Refugio or Gaviota. 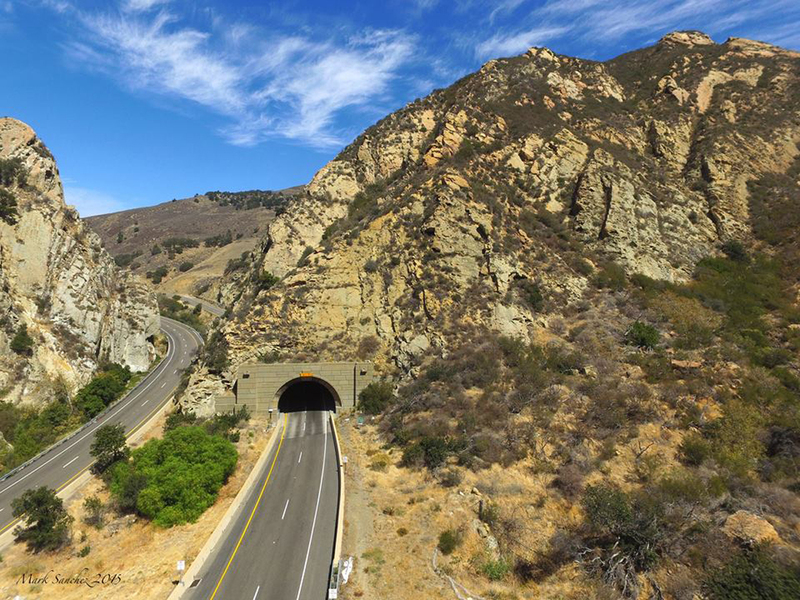 The Gaviota Pass is the only real gap in the Santa Ynez mountain range for miles. The steep and rugged mountains rise about 2,000 feet on each side, which makes for a scenic drive today, but historically, it was a force to be reckoned with. The Chumash had multiple trails that took them over the crest of the coastal range for their frequent visits to the back country. But when the Europeans showed up with their livestock and carriages, they needed some wider roads. The first Spanish expedition to come up the California coast by land was led by Gaspar de Portola in 1769. 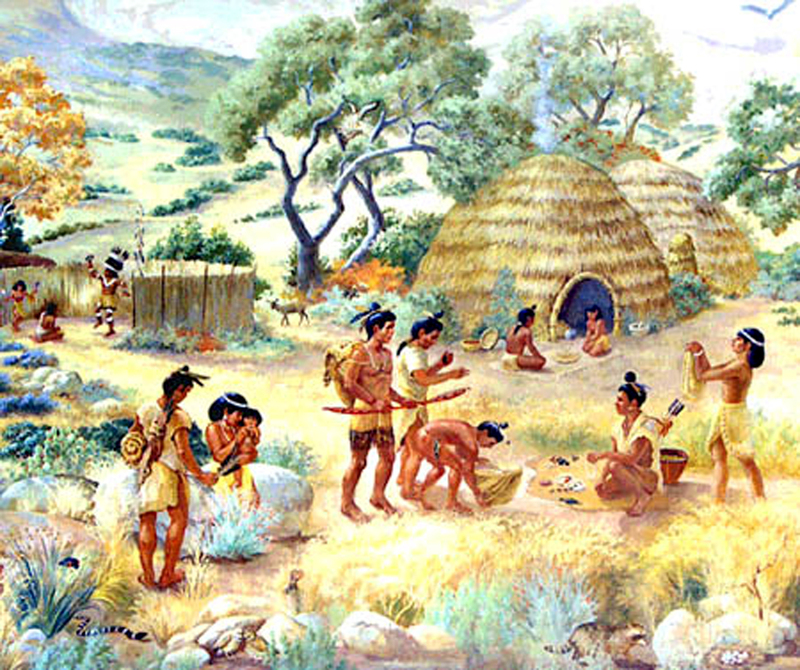 One night they camped at a Chumash village on the beach called Onomyo. This village was near a small gap through the mountains that the natives used as a pass. 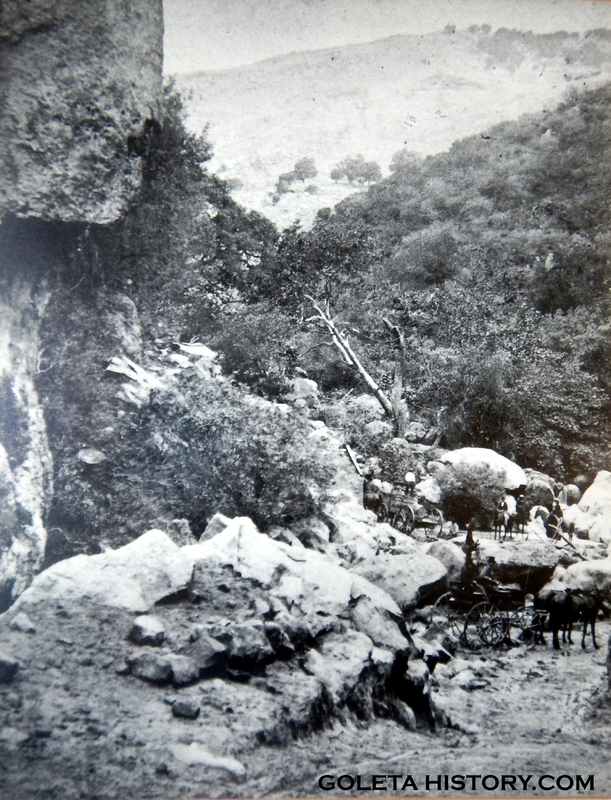 Portola chose to continue north on the beach, as the Chumash passage through the mountains was deemed too narrow and dangerous. His journey up the beach from there was recorded as the worst part of the expedition so far, allowing for very difficult travel and only at low tide. Father Juan Crespi kept a journal of the expedition and he named this camping spot, San Luis Rey de Francia, but he noted “the soldiers know it as La Gaviota, because they killed a seagull there”. The soldier’s nickname stuck. After the Spanish settlements were built, traffic up and down the coast became more frequent. 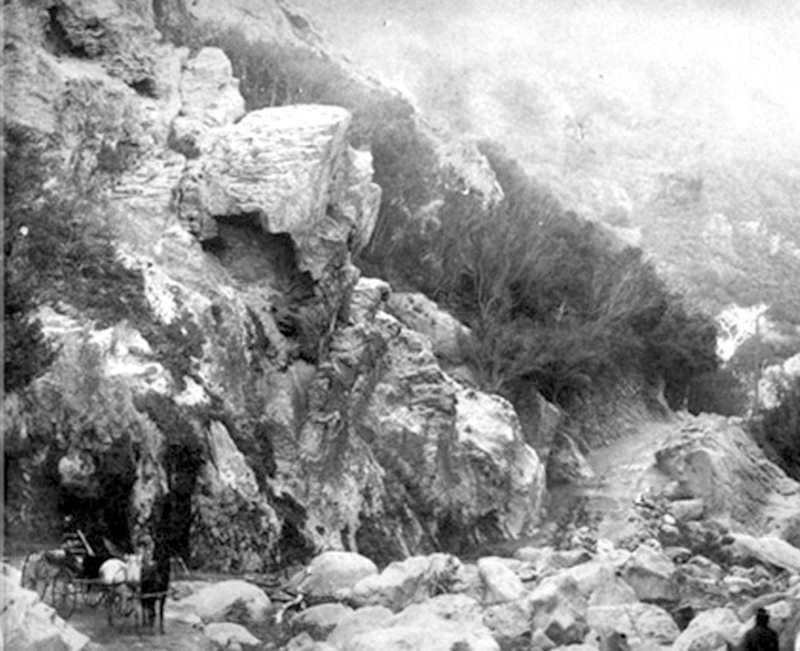 Brave travelers began to make their way through the rocky gorge instead of taking the difficult beach path. It was often blocked by boulders that fell off the cliffs, flooded out, or obstructed by mud and debris. An adventure, to be sure, especially wearing a fancy long dress! 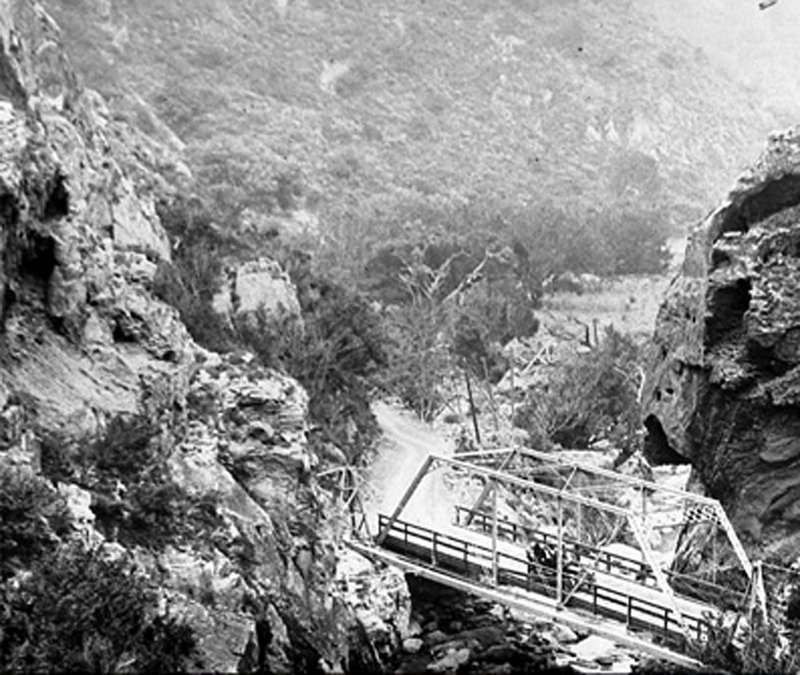 A popular story describes how in 1846, famous explorer and U.S. soldier Lt. Col. John C. Fremont was nearly ambushed at the Gaviota Pass. 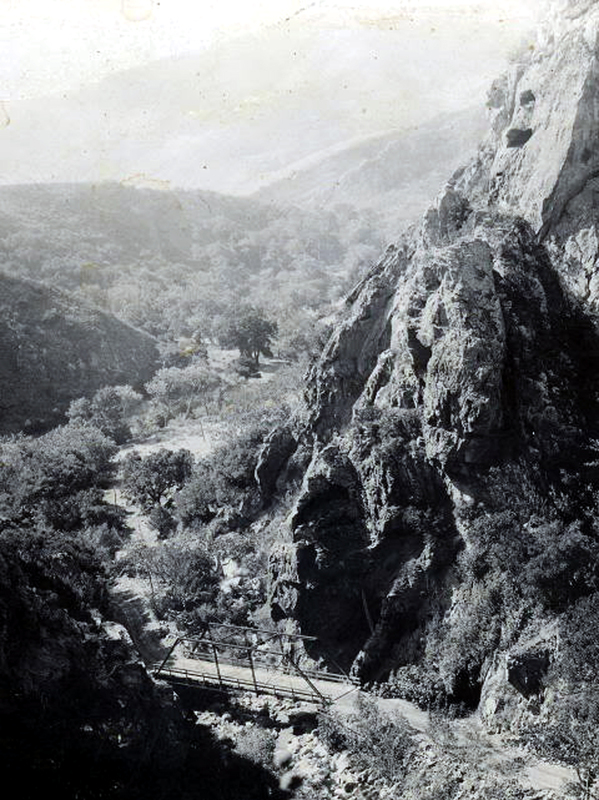 Supposedly, natives and soldiers from the Presidio of Santa Barbara waited on the cliffs above to push boulders down on Fremont and his troops as they passed through. 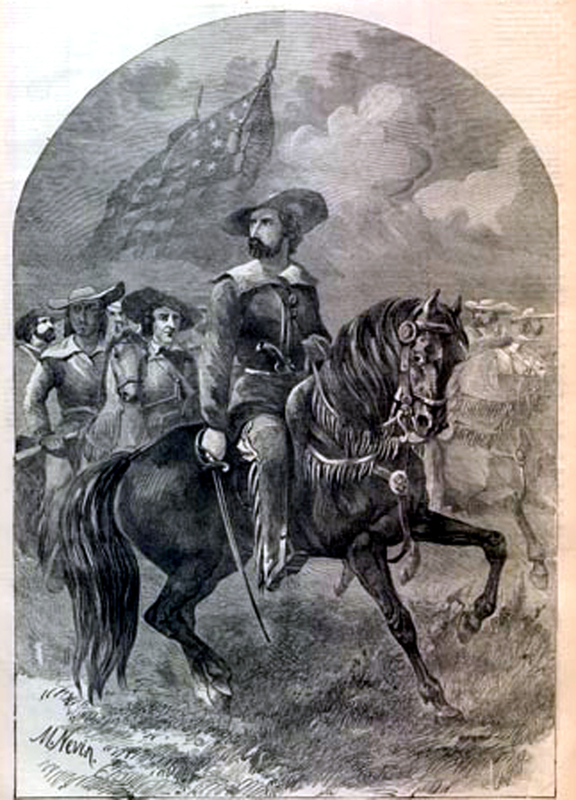 Advised of the plot by Benjamin Foxen, Fremont was guided over the rugged San Marcos pass instead, and captured Santa Barbara for America without any bloodshed. Walker Tompkins states emphatically in his books that this is not a true story. 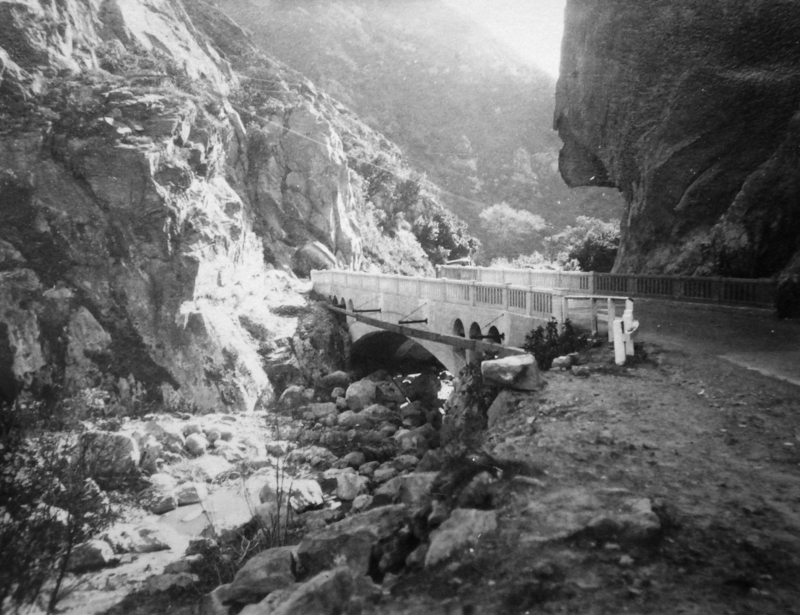 He writes that the Mexican soldiers were in Los Angeles and the Gaviota Pass was flooded at the time by heavy rains. 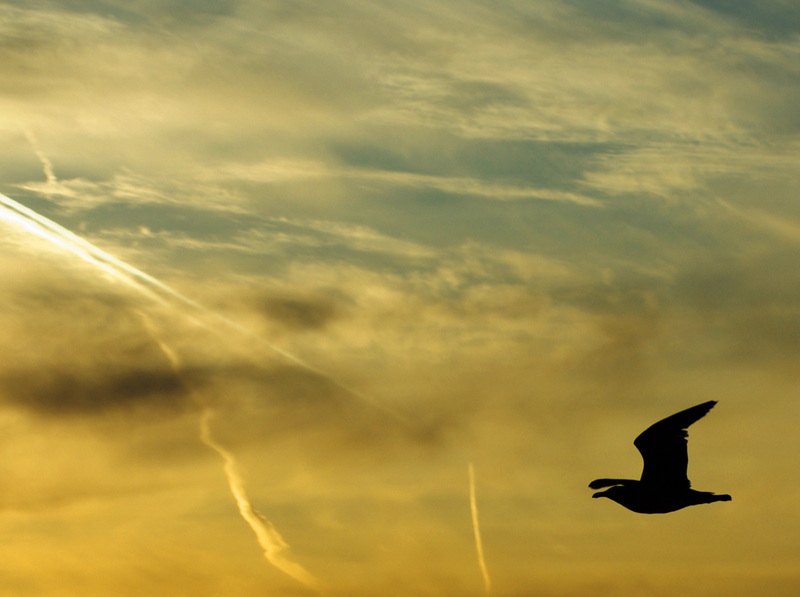 Still, Foxen may have thought they were at Gaviota….Quien sabe. 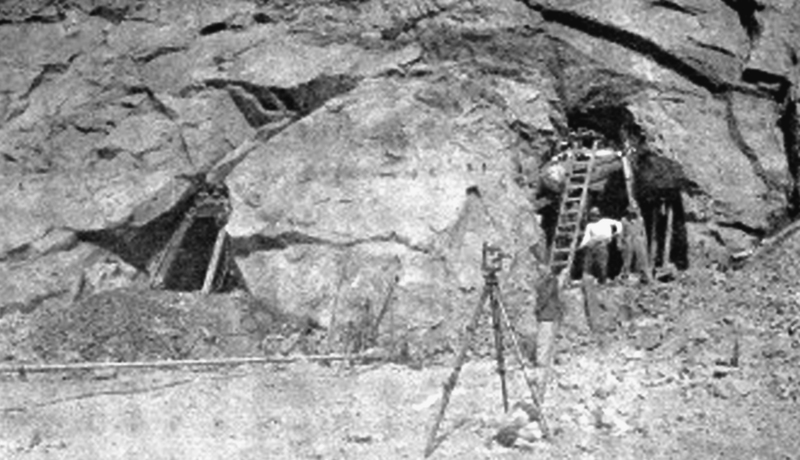 In 1854, chisels were taken to the rock walls to widen the trail enough for wagons to fit through. Passage was still treacherous, and the flow of the creek could still make it impossible. 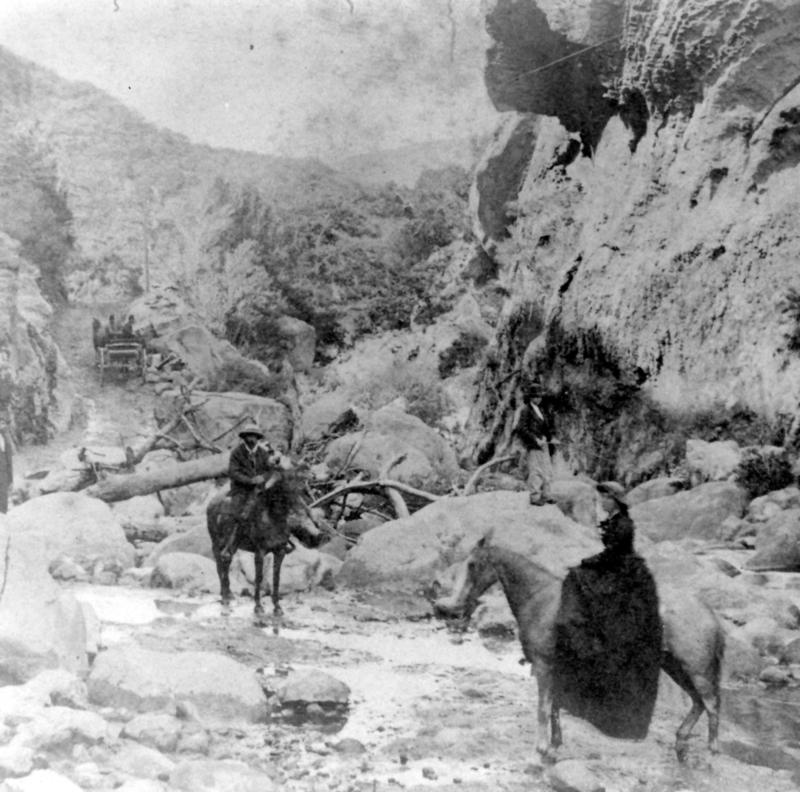 Traffic continued to increase in the 1860’s as more ranches developed in the Valley. 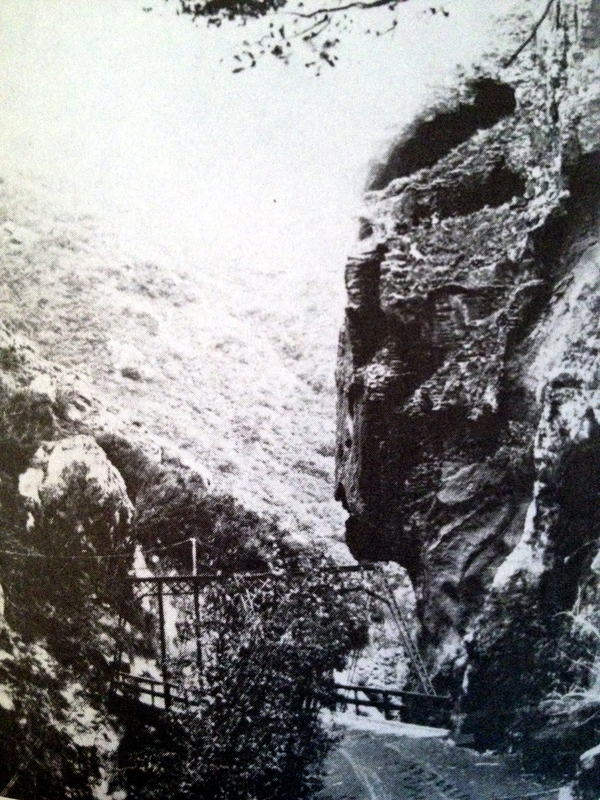 The earliest travelers made note of the large overhanging rock on the west side of the pass that resembled an Indian head, watching over the pass. It’s still there today, hanging over the southbound lanes. 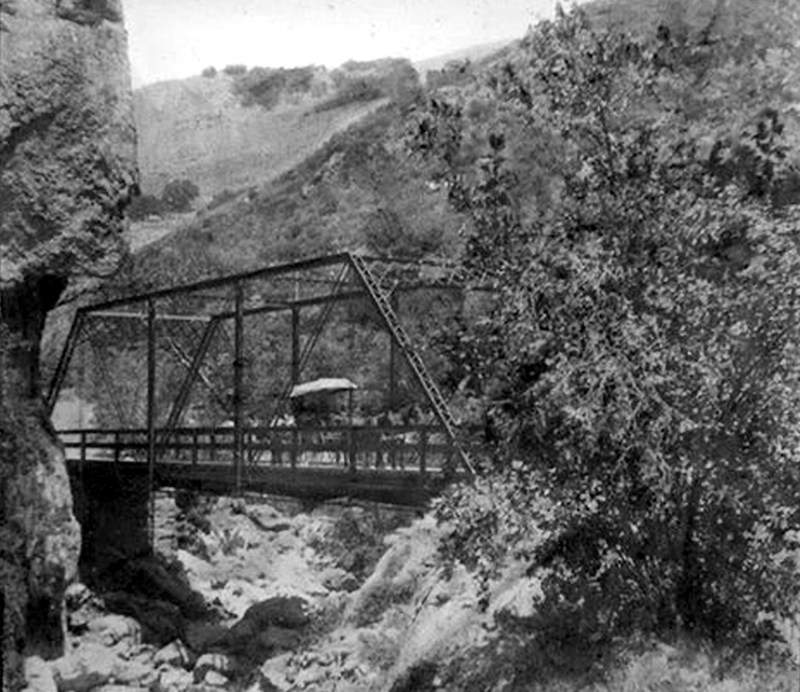 In 1861, dynamite was used to widen the pass and the first county road was finished with a wooden bridge over the Gaviota Creek. Despite the improvements, heavy winter weather could still shut the new road down. 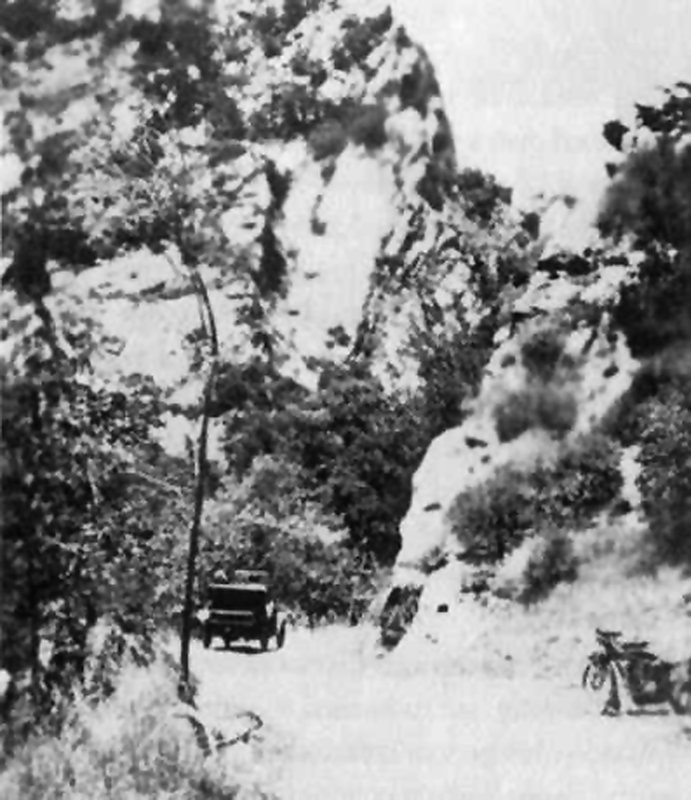 The Gaviota Pass became heavily used by the Overland stagecoaches and relay stations began to pop up along the route. This was an ideal ambush spot for notorious thieves and outlaws who would prey on the stagecoaches and lone travelers. 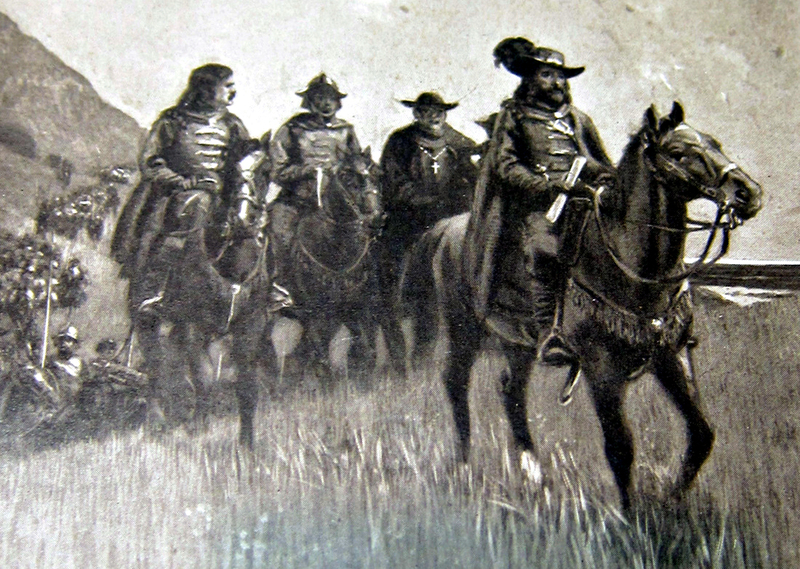 These bandits were the reason that folks traveling through Gaviota were usually well armed and especially cautious. 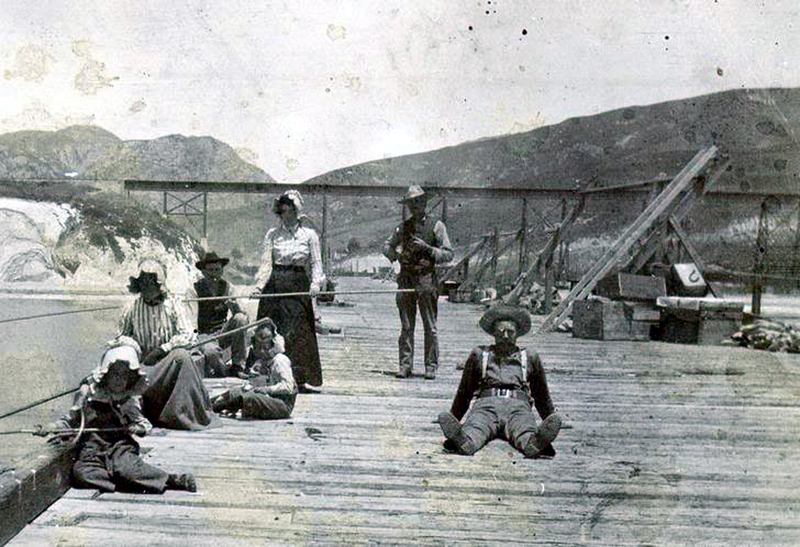 In 1875, the Dibblee and Hollister families built a wharf at Gaviota beach they called Port Orford. The 1000 foot wharf was used to ship out wool, livestock, lumber, and grain on steamships. It was also a great place to take the family fishing. Check out those fishing poles! With the construction of the wharf, the pass got even busier. Ranchers from the Lompoc and Santa Ynez Valleys would drive their cattle, pigs, sheep or goats down across the bridge to the wharf to be shipped out. Pity the traveler that arrived at the Gaviota bridge when a herd was being driven through. It would be a long wait before they could resume their journey. 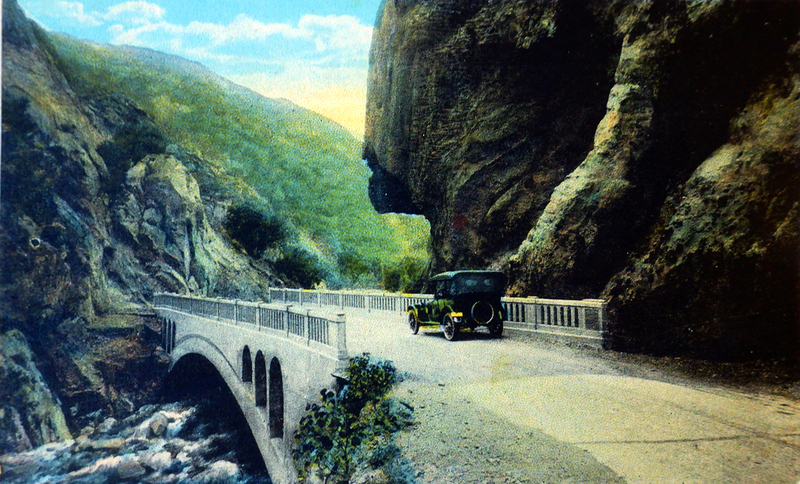 With the turn of the century, motorized vehicles began making their way through the pass. They went faster and had more delicate tires than wagons, so the roads needed another upgrade. In 1915 the State Division of Highways took control of the road, graveling, straightening and widening it. 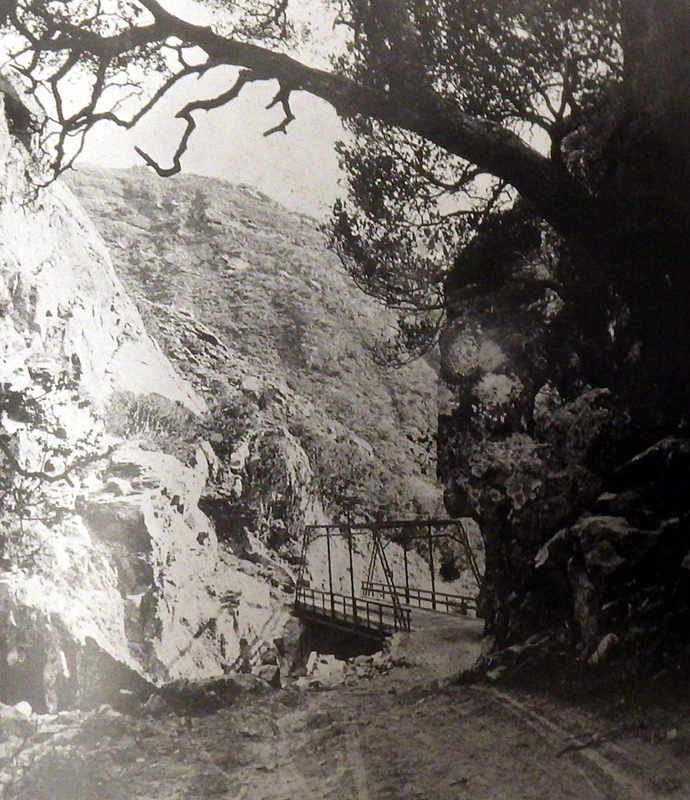 The wooden bridge was replaced by a steel suspension bridge. Meanwhile, the Stone Indian kept a sharp eye on the changes. 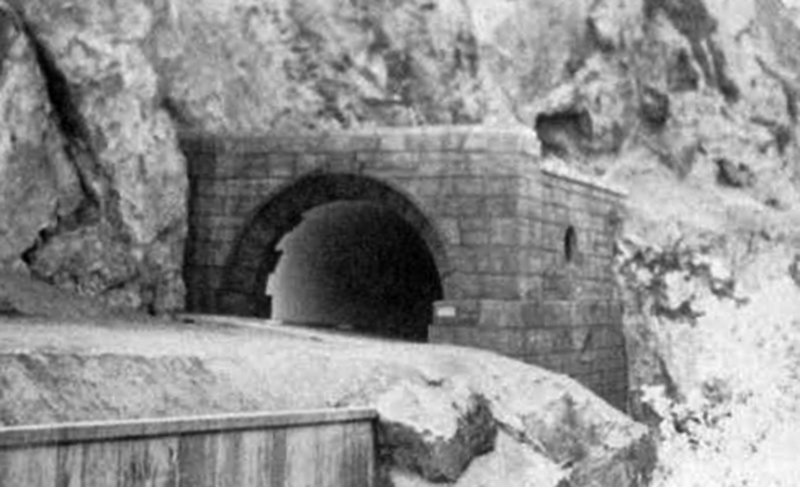 1931 brought more improvements to the pass. The road was again widened, straightened, paved and a new concrete bridge replaced the steel bridge. This alignment serves as the southbound lane of the freeway to this day. 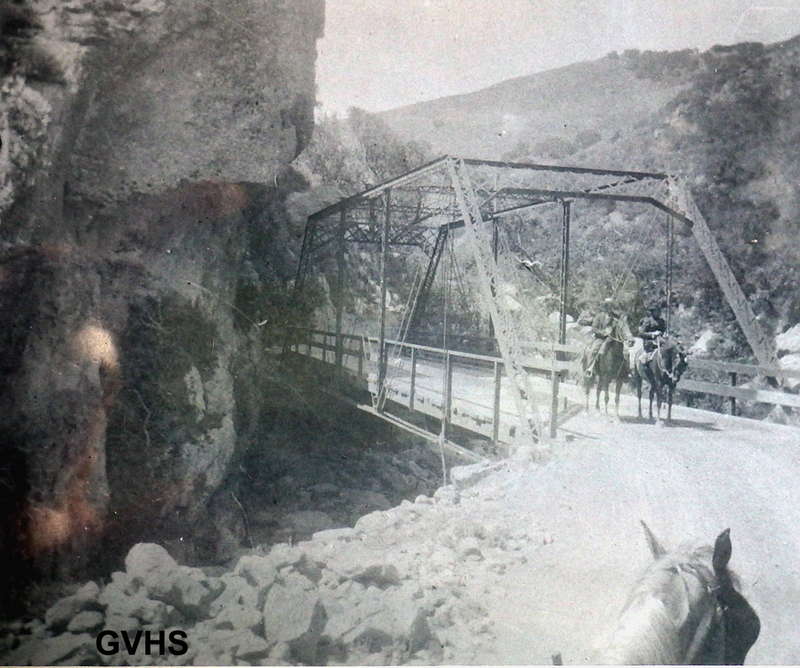 During construction of the concrete bridge, there was some concern about the Stone Indian rock hanging over the west side of the new road. Experts recommended its removal for safety reasons. But folks protested the destruction of the iconic rock, and after some safety modifications were made, the Stone Indian head was allowed to remain. 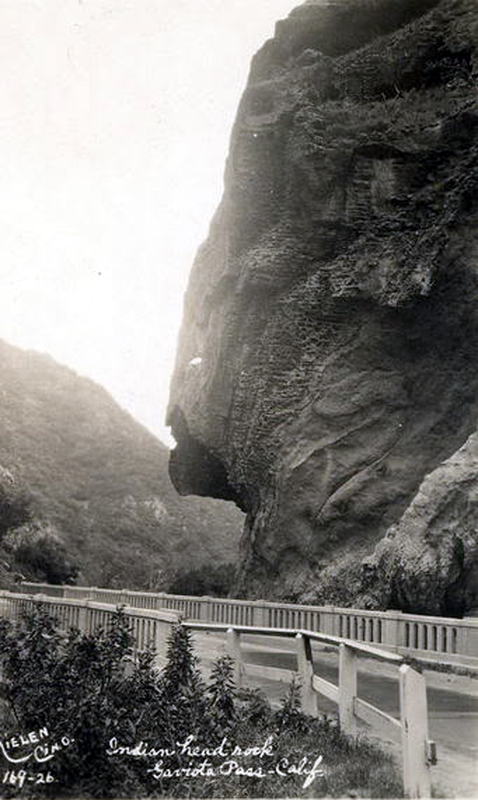 This photo from the 1930’s has the handwritten inscription, “Indian Head Rock, Gaviota Pass”. 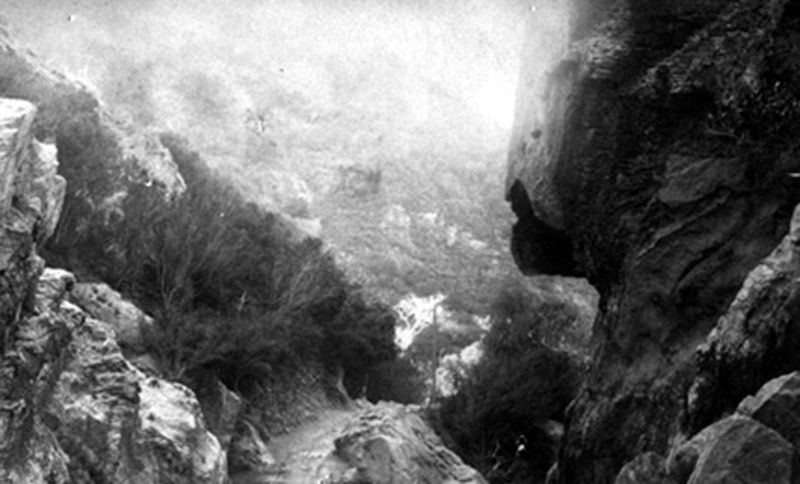 The two black lines in this photo from the 1900’s show two rock features that are still there today. The boulder on the left and the Stone Indian on the right. The red lines show those same formations as they look today. 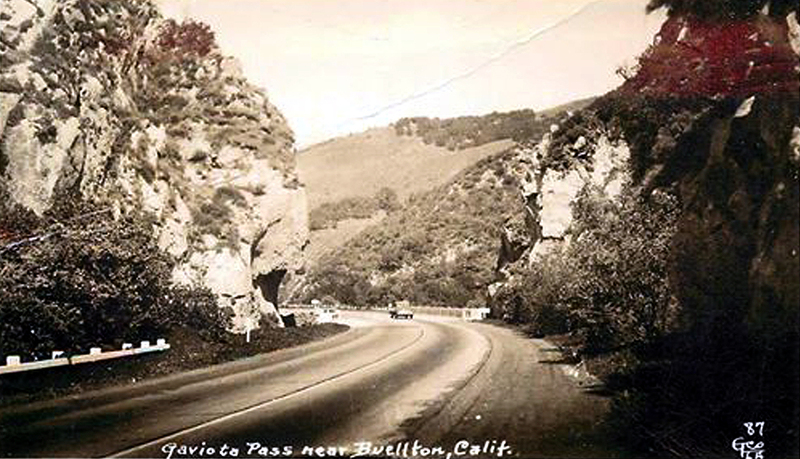 For about 20 years the Gaviota Pass looked like this, a narrow, two lane highway. 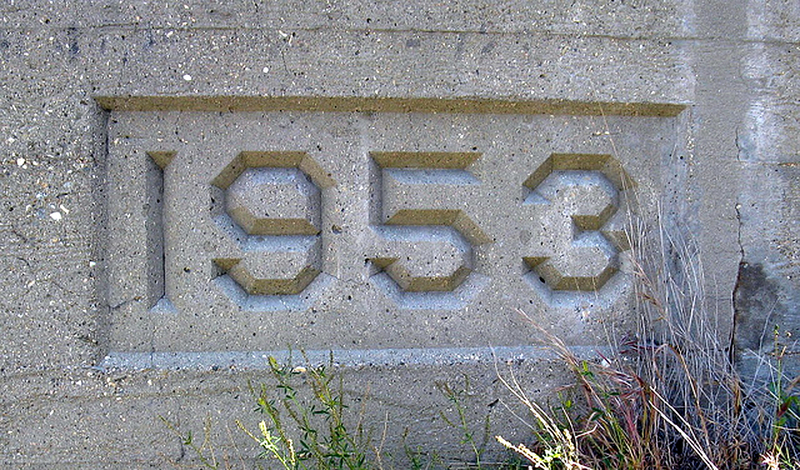 After World War II attention was turned to improving the Coast Highway. This was a very important part of that highway, as it was the only pass on the coast from south to north. Faster moving cars demanded more room on the road, so something had to be done to widen this gap. 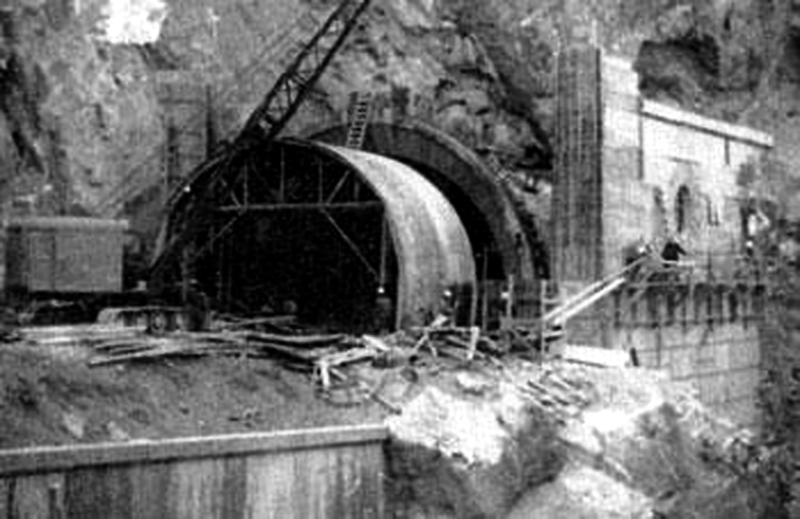 Rather than further widening the pass by removing massive amounts of rock from the mountainside, a tunnel was “holed through” on the east side of the gap, starting in 1952. 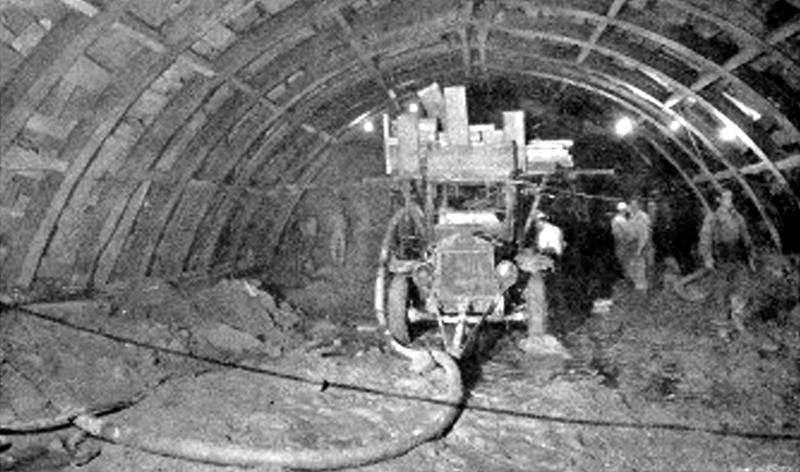 The tunnel could only be bored out from the south side because there was no safe way to remove the dirt and rock from the north end. Heavily loaded trucks crossing the existing highway on the blind corners to the north was way too dangerous. 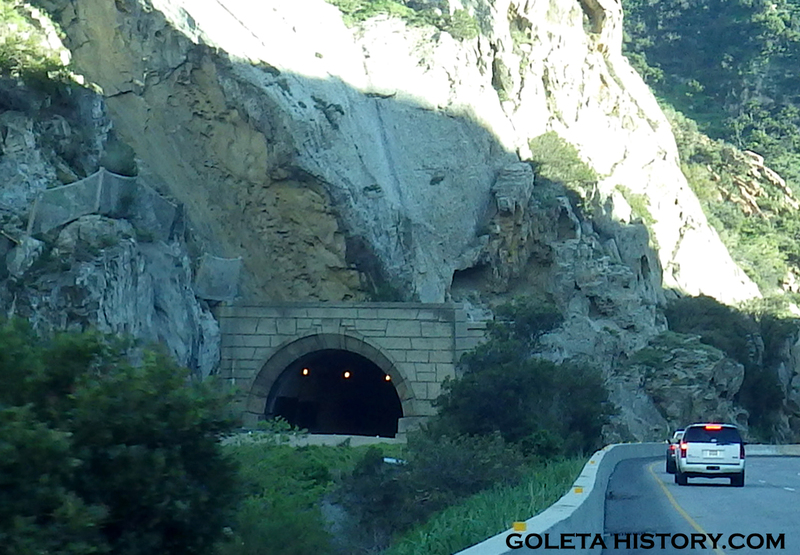 The lights in the tunnel were the first power lines in Gaviota Valley. 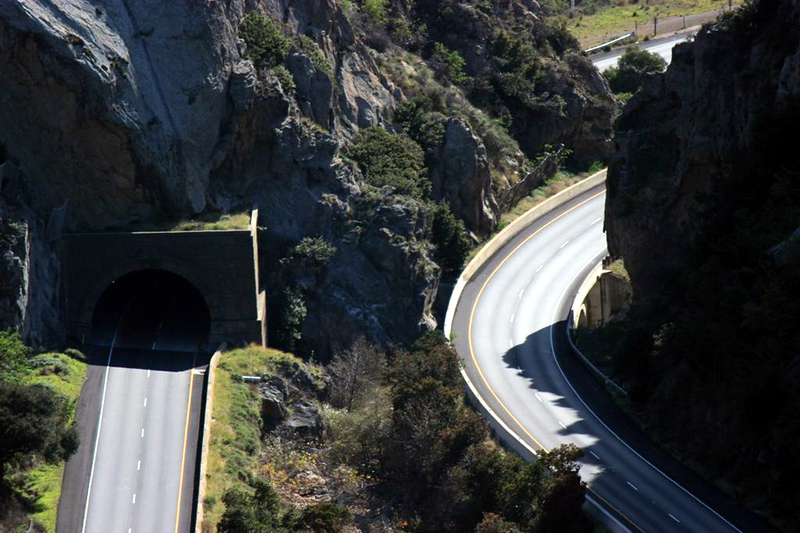 The tunnel is 435 feet long, 35 feet wide and 18 feet high. The walls contain 18 inches of cement. 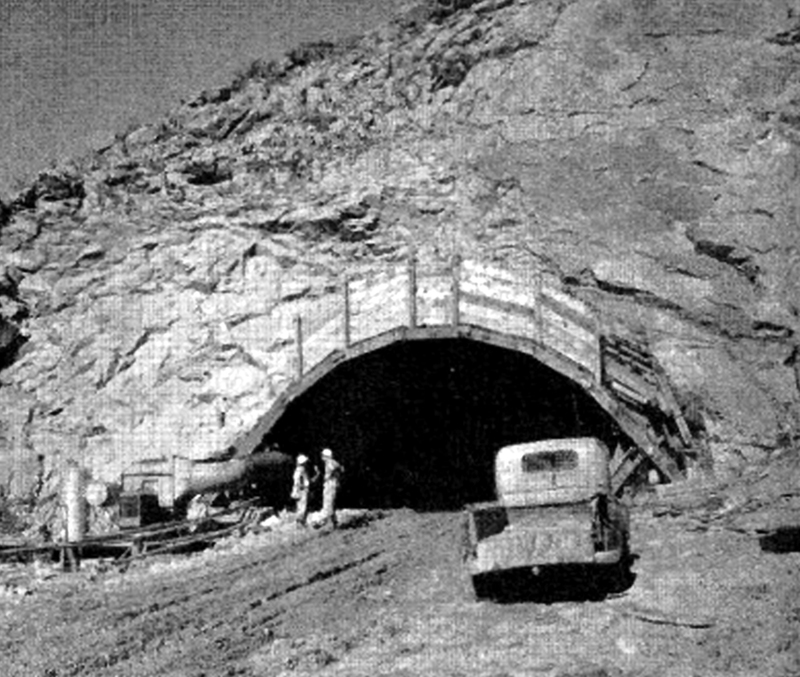 The Gaviota tunnel was completed in May, 1953. 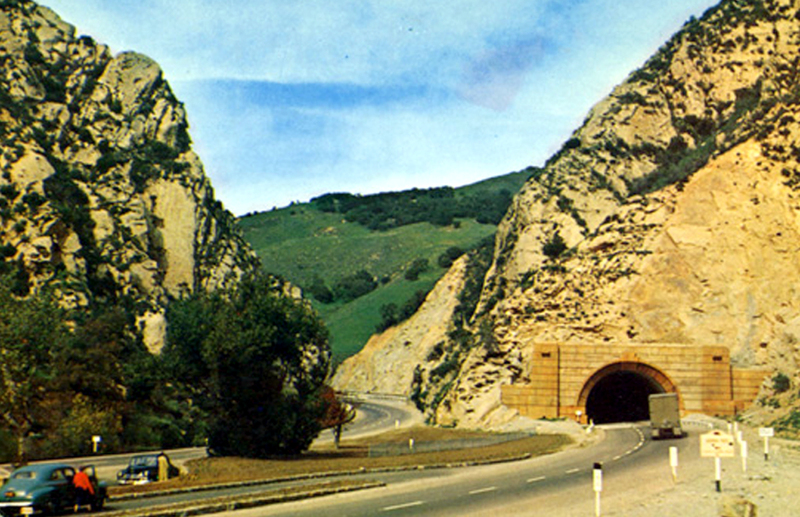 The Gaviota tunnel has had its share of Hollywood fame, featured in The Graduate, Wayne’s World 2, and Sideways. In the first two films, the actors travel the wrong way through the tunnel, supposedly heading southbound. Check out how reckless Dustin Hoffman drives through the tunnel! 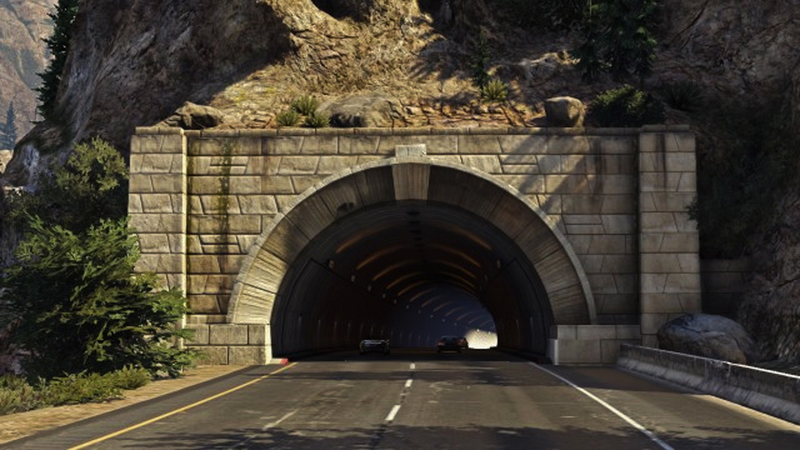 In the popular video game, Grand Theft Auto V, a beautiful representation of the tunnel is known as the “Braddock Tunnel”. 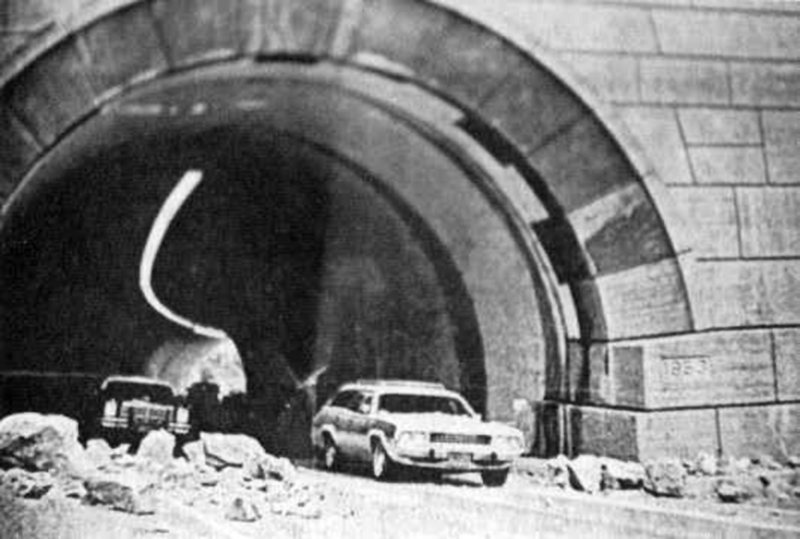 The earthquake of 1978 shook some boulders down onto the highway but luckily no one was hurt. 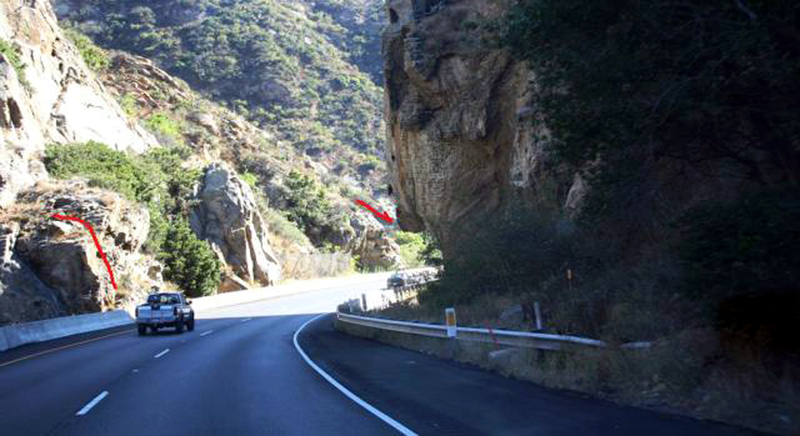 There are still rockslides in the area, especially during and after rain. Heavy duty nets designed to catch falling boulders, seen in the upper left, were placed above the highway in 1992. 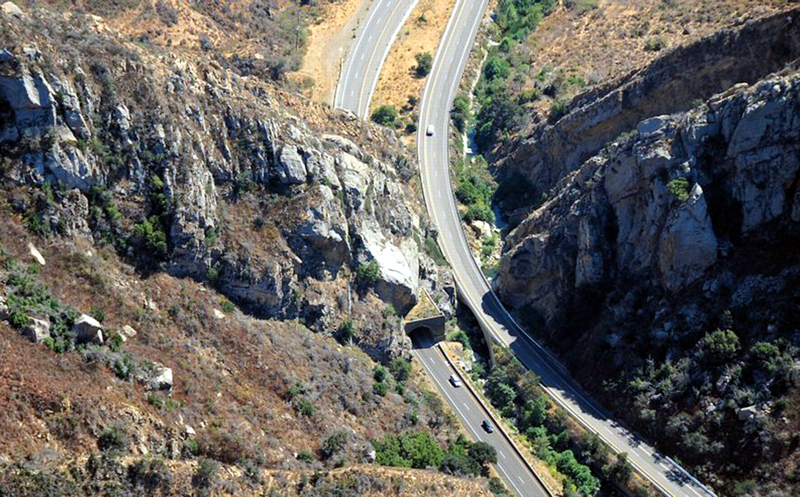 A smooth and beautiful drive today, this narrow crack in the Santa Ynez mountain range went from a rugged foot trail, to a rocky, dirt stagecoach road, to a wooden bridge, then spanned by a steel bridge, then paved over in a cement single lane road for cars and finally a divided asphalt highway. 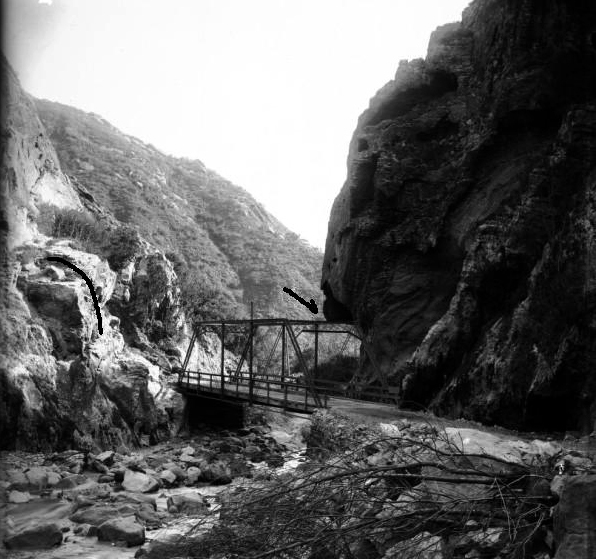 The southbound lane on the right crosses over Gaviota Creek and squeezes through the same tight gap that Chumash villagers used to visit the inland valleys for centuries before. And all the while, the Stone Indian quietly watches over his domain. 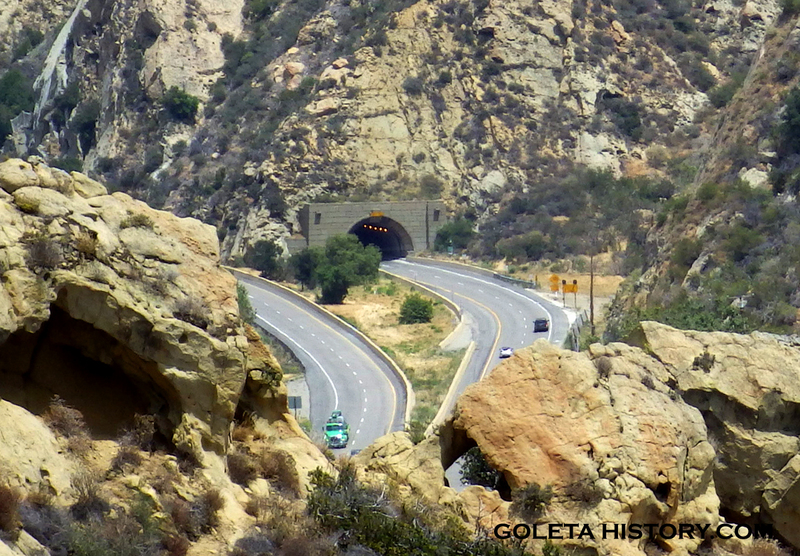 So the next time you zoom through, appreciate the importance and the wonder of the Gaviota Pass. Fantastic article! 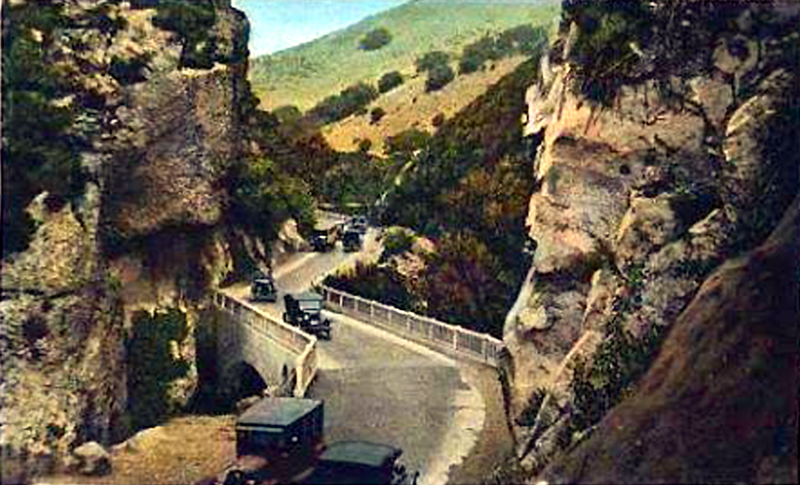 It’s amazing that you have assimilated so many great photos of all the different eras and stages through the Gaviota Pass! great read – and the photos, tom! – thank you! Thank you for the educational story. I feel happy to know a little more about this tunnel I’ve been passing through my whole life. 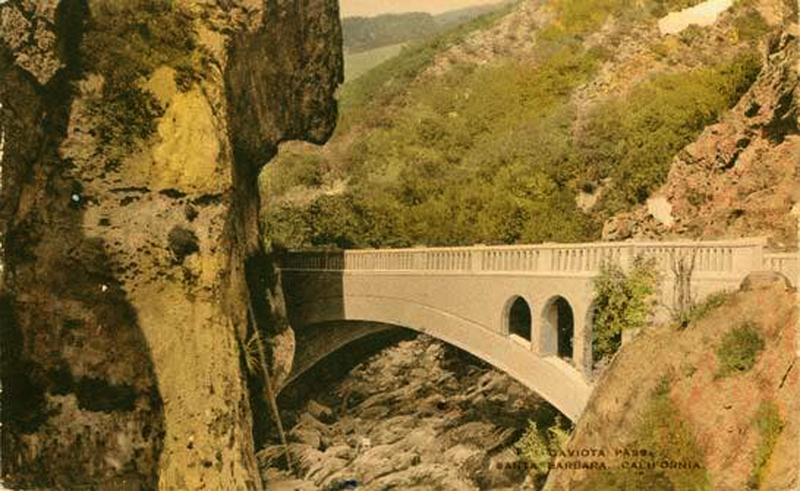 Would love to have the Gaviota Story for a scrapbook about S B County for my senior park near Santa Maria. Thanks so much for the history. This gives me a greater appreciation for the area every time I drive through it. Thank you Rodney! It’s a special place. Excellent historical account of this beautiful area!!! !